Developing and releasing superior products in large companies always depends on efficient collaboration, i.e. properly organized interaction between all members of the team. In order to greatly facilitate the process of joint development, Jelastic PaI provides an account sharing feature. The main idea, is to let organizations create one primary account, where all necessary environments are running, and to share certain or all activities with other accounts (e.g. members of the development team). All accounts of an organization are interconnected in such a way, to enable collaboration. Any user (regardless if they are registered at Jelastic), can join (i.e. should be invited by a primary user) or leave an organization’s collaboration. The primary one is the main billing organization’s account. The primary account owner can manage the list of all other collaboration users, specify their rights for performing certain activities, decide on the access to be shared within collaboration environments, etc. All of the charges for using shared environments are applied to this account. A collaboration user can work with shared environments of the primary billing account, being able to deploy applications, change configurations, read log files, view statistics and so on. The only exception, is that this user cannot clone or delete environments. 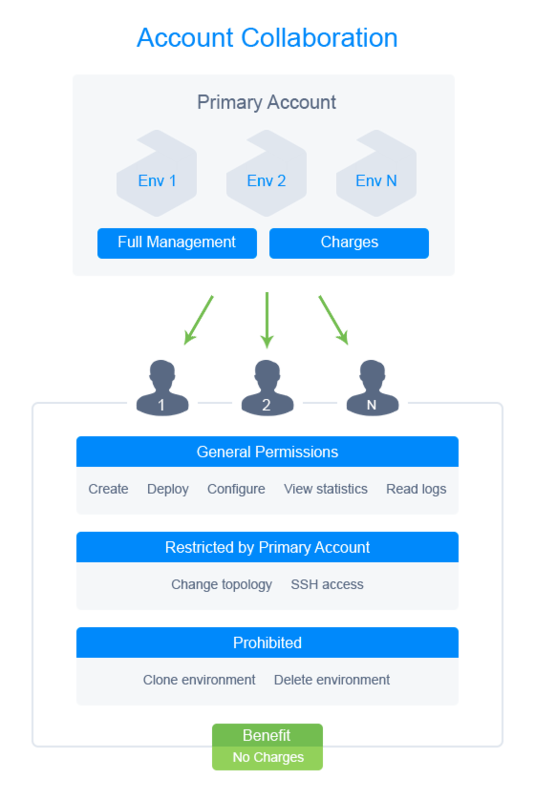 A user’s ability to change an environment’s topology and access this environment via SSH, is regulated by the primary account owner, when the particular environment is shared. A user can also be allowed to create new environments on the primary collaboration account. In this case, there will not be any restrictions for a trial user while setting up the environment (e.g., number of cloudlets available). All of the charges for such environment usage will be applied to the primary account. Note: that after leaving the collaboration, the user will no longer have access to this environment. 1. Select the Settings button in the right top corner of the Jelastic dashboard. 3. Using the buttons in the left subsection, you can invite users to join your collaboration, edit their rights or exclude them. 4. In the opened window, enter the email of the required user. Tick the “Allow user to create new environments” line if you would like to give such permissions. 5. 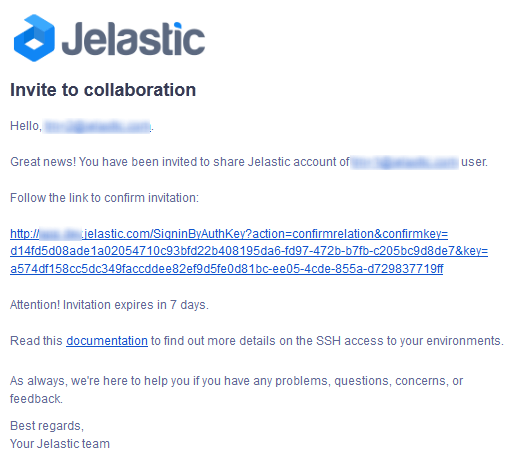 The specified user will receive an invitation email with a confirmation link which remains active over the following 7 days (the period can be changed via the Jelastic cluster admin). After acceptance of the invitation by clicking the confirmation link, a user will be redirected to the Jelastic dashboard without the necessity to enter any credentials. If a user wasn’t registered at Jelastic before, the account will be automatically created and a user will be notified via email. 6. After confirmation, a user will appear in the list of collaboration’s members. Now you have your own account collaboration and can distribute tasks among your team, in order to gain higher performance and many additional benefits. In our next blog post, we are going to provide more information on how to manage your shared account: the permissions you have and access levels you can provide to others, the functions that can be performed and the ways to restrict or increase the influence of your team members on the collaborated account. To learn more about collaboration, register for a free trial account and see the benefits of account sharing in the Jelastic Cloud.